This item is subject to the General Exception procedure. It is proposed to take a key decision on the decision date shown below. It would be impracticable to defer the decision. This notice has been issued to the chairman of the relevant overview and scrutiny committee. Contact: Karen Knight Email: kknight@herefordshire.gov.uk Tel: 01432 383042. To replace energy inefficient lighting across two* sites with energy efficient Light Emitting Diode (LED) lights in order to reduce energy and maintenance costs in addition to reducing carbon emissions. at Plough Lane to use variable speed drives (that are able to adjust the electrical supply to an AC induction motor) that regulate the speed and torque output of rotational motors of primary pumps including the Air Handling Unit. These would be integrated into the existing Business Energy Management System ensuring the building operates at maximum levels of efficiency and removing wasted energy usage and associated costs. Contact: Richard Vaughan, Renewable energy officer Email: Richard.Vaughan@herefordshire.gov.uk Tel: 01432 260192. To use locality powers to approve a two year extension to business rate reliefs to new businesses locating on Hereford enterprise zone, capped at the value of business rate growth attained in prior years. Contact: Josie Rushgrove, Head of corporate finance Email: jrushgrove@herefordshire.gov.uk Tel: 01432 261867. Lobby central government for change to NPPF regarding housing. To agree to lobby central government for a change to the national planning framework to enable local planning authorities to take personal circumstances into account as material planning considerations where proportionate residential development is considered necessary for a person suffering from a serious disability, or some other unusual or exceptional circumstances, and is supported by professional medical or other evidence, to enable that person to maintain and enjoy an acceptable quality of life. Contact: Angela Newey, Senior planning officer Email: Angela.Newey1@herefordshire.gov.uk Tel: 01432 383637.
http://www.itsourcounty.org/wp-content/uploads/2016/03/HC-Logo.png 150 191 PaulNeades http://www.itsourcounty.org/wp-content/uploads/2019/02/IOC-crop-Colour-1.jpg PaulNeades2017-10-25 11:30:482017-10-25 11:31:05Lobby central government for change to NPPF regarding housing. Reason for urgency: Exemption from call in reasoning – to allow Cabinet to approve the application to be a member of a business rate pilot pool with LEP partners in advance of the deadline set by central government, a further report will be provided if the application is successful. Contact: Gary Angove, Property services manager Email: gary.angove@herefordshire.gov.uk Tel: 01432 383869. To consider the impact on Herefordshire’s small businesses as a consequence of the works that are required to deliver the successful bid to the Departments for Transport’s Tranche 2A of the Local Highways Maintenance Challenge Fund, the options by which that impact can be mitigated and decide on the action that shall be taken to mitigate the impact of these works on small businesses. Reason for urgency: Decision required in response to concern as raised by small businesses. To approve the expenditure required to complete the procurement of the development and regeneration provider including a financial assessment of the identified preferred bidder. The financial assessment is required as part of the due diligence process to ensure that the preferred bidder is of sufficient financial standing to enter into the contract. The assessment will support the chief finance officer in deciding whether to support the award of the contract. Contact: Robert Ewing, Commissioning programme delivery manager Email: rewing@herefordshire.gov.uk Tel: 01432 383660. 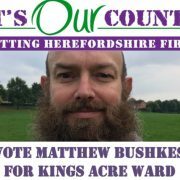 Matthew Bushkes for Kings Acre Ward. Its Our County Councillor Matthew Bushkes after a successful couple of years as City Councillor is also standing for County Council in the Kings Acre Ward. Matt has a proven track record in his ward and community helping the constituents that he represents and getting the job done. Matt looks forward to your support on the 26th October 2017. To approve an updated strategic approach to re-settlement of refugees and asylum seekers and the provision of support to them. Contact: Amy Whiles, Refugee and asylum seeker coordinator Email: awhiles@herefordshire.gov.uk Tel: 01432 261920.